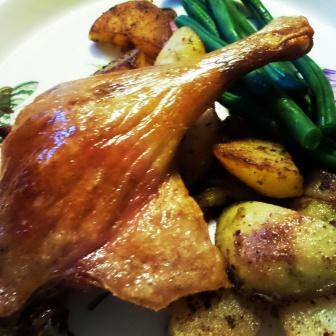 So … what do duck legs and a hairdryer have in common? It maybe a bit tenuous, but the link is the Queen of Puff Candy herself, the lovely chef, Jacqueline O’Donnell from The Sisters restaurants in Glasgow. When she hit our TV screens back at the regionals of the Great British Menu in 2014, she got some stick from her peers on the show for giving the suckling pig a blow dry. But, if you think about it, that makes perfect sense. The skin needs to be really dry to produce crispy crackling. Not to be outdone, I followed Jak’s example and turned up the heat on duck legs in the hopes it would have the same result. What else would you use a hairdryer for? This is a simple, but slow-cooked, dish with very few ingredients and the results are similar to confit duck but without cooking it in fat. I like to think that there are a couple of calories less in this method. It certainly is easier on the pocket as duck and goose fat costs more than the duck legs! Remove excess skin from the duck legs (the overhanging bits that have no flesh attached); you need to keep the skin covering the meat. Place them on a rack over the sink and pour over boiling water. The skin will contract slightly, which is what you want. 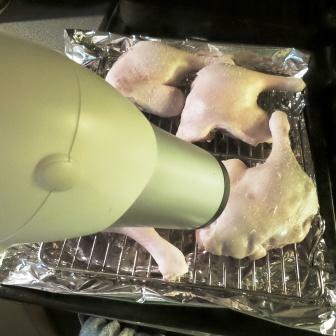 Next, crank up the hairdryer to full and blast the legs until they are bone dry. Pop them onto a rack over a baking tin (the grill pan will do) and shove into the furnace/oven for five minutes. Whip out briefly and sprinkle with salt, then whack back for a further five mins. Turn the lava flow down to almost Baltic (140C/Fan120C/Gas1) for about three hours. Serve the classic French way – sauté potatoes and green beans if it’s summer or slow braised red cabbage for a winter dish. Previous Previous post: The All But Muffin – All But the Kitchen Sink!